Back in May 2013 I made the decision to “Green” my makeup! I was very hesitant because I am a “makeup girl”, meaning I do not go in public without makeup! 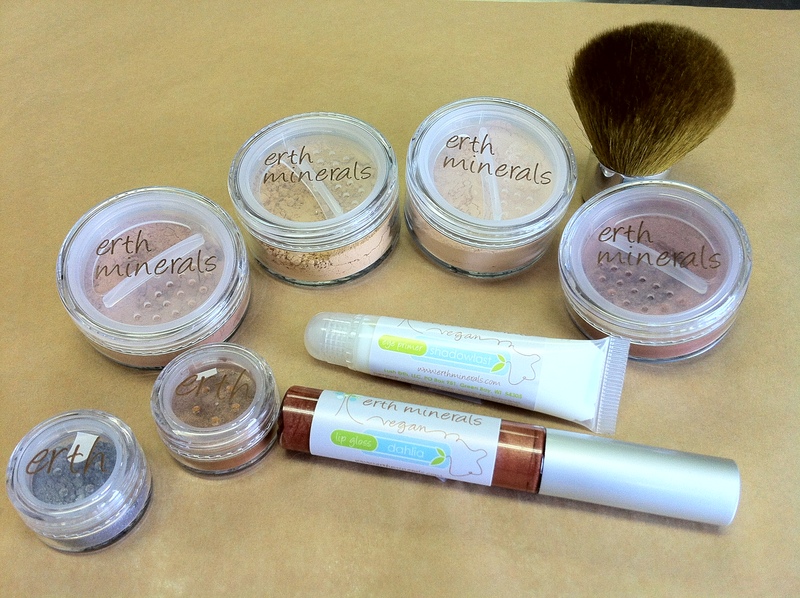 Since I take Makeup and Living Green very seriously I did a ton of research and decided to go with the brand Erth Mineral Makeup. The ingredients are minimal & 100% natural and the prices are very reasonable. You can read more about my experience here The Natural Challenge: Switching to Natural Makeup Easier then I thought! I switched ALL my makeup to Erth since writing that post. All makeup is 100% natural. They only use the finest ingredients and use no unnecessary fillers. Great coverage and a large selection of foundation colors for all skin types and complexions. An affordable option for natural makeup. With any order over $25.00, receive 2 free samples! FREE SHIPPING FOR ALL US ORDERS OVER $55 USD! Maybe you’re like me and can’t wait for the giveaway to end, and you want to try this makeup now! Erth Minerals was gracious enough to offer rays of bliss’s readers a 25% discount! They offer several sample kits and this would be a great way to give them a try with a discount! I highly recommend any of their products, but my favorites are their eyeshadows and their Shadowlast Eye Primer! Be Sure to Enter the Giveaway Going On Now Here. Thanks for telling us bout this make up! You look awesome in your picture are you using it in that? I love mineral make up!! I’m using this makeup in that picture on the sidebar! In fact I think I’m wearing this makeup in every picture on this blog! I love it! Well I am convinced your skin looks dewy soft in the pics you look awesome!! I’m definitely buying some of this makeup!! SO many beautiful colors! I love mineral makeup. I would love to try to make the switch to green make up. I would like to try the black or dark brown to use as an eyeliner. I am looking forward to trying these because they are all natural. Now, my dumb question is this- is there gluten in the cosmetics? I have a sensitivity to it so i have to be careful. Otherwise, I love the colors! Geoorgette, not a dumb question at all! My husband has Celiac so I know how important it is to check all personal care and beauty products ingredients! YES, Erth makeup is ALL Gluten Free! I am most excited to try them because they are 100% natural! i’m most excited because they’re natural! i’m a vegan and gluten free so this is wonderful! (i have many chronic illnesses- that’s why). I don’t wear a lot of makeup because of very very sensitive skin. I’d love to try this out on my skin! Wow, I’d love to try these! As someone with chronic immune disorders, I’m always looking for a healthier route for body products/make up, however, budget usually wins! Also, finding natural beauty products that live up to the expectations set by the standard products isn’t always easy, no matter what the price. I have sensitive skin, so these sound great for me! I am most excited to try them because they are 100% natural and such a great selection of colors. I like the natural makeups and how they feel on the skin- light and airy. I am getting up there is age and this all- natural make-up sounds like something that I would like to try. I love mineral makeup, it’s the only stuff that doesn’t make me itchy! I love the free samples with orders too, I can’t wait to check them out. I love mineral make up. They feel so much better on my face. I love that they are natural. I can’t wait to try these because I haven’t tried mineral makeup yet. These are so awesome! I haven’t tried any mineral makeup yet, but I’d love to. I am really delighted to know that all your make-up is entirely Gluten-Free. Hurray for you! And (especially) hurray for me! I love those colors. I like the ingredients of this makeup too. I am excited to try this makeup because I have never tried green makeup before. I like mineral makeup, so would love to try this. I’m pregnant and nursing, so chemical free products are important! I try to limit the amount of chemicals I put on my body. I don’t wear a lot of make-up but I would love to make the switch to a healthier make-up for the times I do. I am going to have to look into Erth Minerals , because my skin has become so incredibly sensitive. I really think switching to a natural makeup will help me. I really want to try the Shadowlast primer! The colors are very nice and I like organic makeup. My skin is sensitive so I like all natural. I love that there are natural options for makeup! This looks like a great company! I would love to try this makeup because I rarely get a chance to buy green/chemical free makeup for myself! It would be a great treat! The colors look so bold and gorgeous! I love anything green, especially for my face! I do not believe I have ever heard of them before though…would love to try. I’m excited to give them a try because their makeup is 100% natural. Hey Laura, I’m glad my review helped you! I love this makeup and I’m so glad it worked for you too! They have a great selection, love it! Wish they had eyeliners too… My friend just came out with this great safe and natural makeup remover, you should give it a try… you can buy it here https://ecohabitude.com/products/12816/nourishing-eye-makeup-remover, but I am sure she’d love to send you a sample if interested?